I came across an article on shilajit and its health claims. This article quotes a western pharmacist who says that there is no known benefit of shilajit or other rock extracts. The same article also quotes an Ayurvedic specialist who mentions the health benefits of shilajit when taken in small amounts. My thinking is that shilajit might be new to the developed world but it’s been used for centuries in Indian traditional medicine. In the US, shilajit is sold as powder and capsules, and can cost anything from 10 USD to 100 USD. I’m not sure if shilajit is similarly available in India. Shilajit is a rock extract from the Himalayas containing a variety of minerals, and is an ingredient in many ayurvedic preparations including chavanprash. According to ayurveda, it is a good antioxidant and helps in anti aging, treating anemia, arthritis, etc. But, it can be harmful to health when taken in large doses. 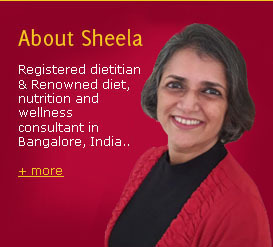 It’s best to check with a qualified ayurvedic physician before taking shilajit. 1 Comments | Posted by admin at 4:54 am. 1 comment. Somebody once remarked “When blackberry and apple were fruits, the world was a much better place”. Similarly, when children ate fresh, home-cooked food, their health was far better. New research has found that in children, type 2 diabetes (adult diabetes) progresses much faster and the complications related to diabetes appear much sooner in life. This means we might see heart disease, kidney disease and other diabetes-related problems in younger adults in future. An excess of junk foods, processed foods, refined foods, eating out frequently, coupled with physical inactivity is leading children to adult diseases in their teenage years. It is not uncommon to see obesity, high blood pressure, high cholesterol or type 2 diabetes in school or college going children these days. A preventive measure will certainly help. 0 Comments | Posted by admin at 8:50 am. Leave a comment! Some of you might have tried the winning salad that I published last week. 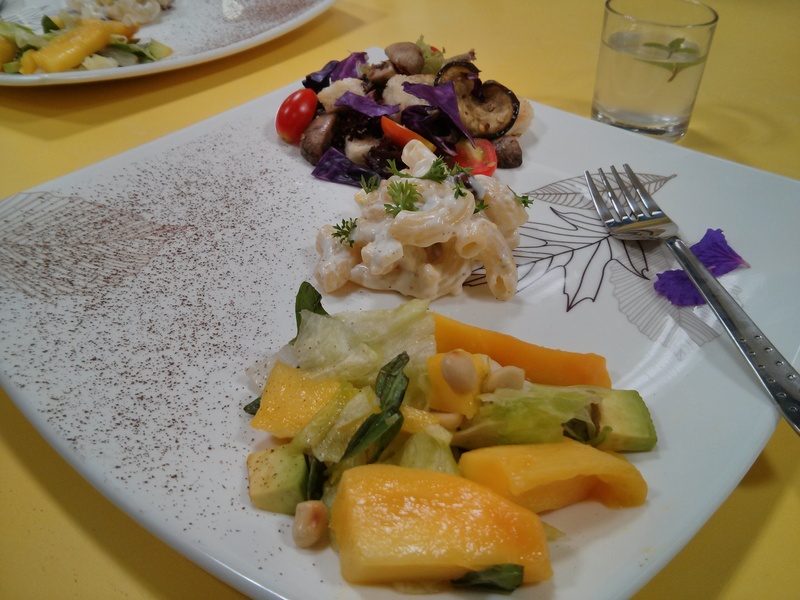 Here’s the recipe of another salad that won in the contest. This was made by Kirthika Nallan Chakravathy. Chop onion and mix it with boiled groundnuts. Scoop the pulp of the avocado and mash it until it forms a paste. To it add the cream, milk, garlic, green chili, cilantro, sugar and salt and blend them together in a mixer. Take 3/4 of the paste and add it to the onion-groundnut mixture. Add a pinch of pepper to it. Leave the bowl in the refrigerator or on top of ice for about 15 to 30 minutes for it to chill. At the end of 20 minutes, add chopped tomato. For the “cube” part of the salad, boil carrot, potato, beetroot in separate containers, so that their colors don’t mix. Cut the carrot, beetroot, cottage cheese and potato to even sized cubes and arrange them to resemble a Rubik’s cube. 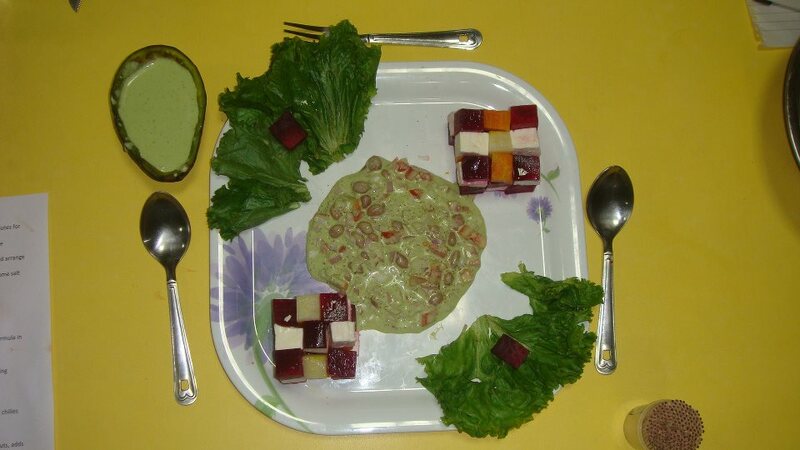 Use the remaining 1/4 avocado paste to glue the cubes together, sprinkle some salt and lemon juice on the cube. Make another Rubik’s cube of the same kind. Place the cubes on either side of the chilled salad. 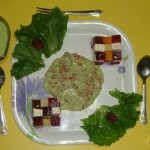 Use lettuce leaves for presentation. Fresh and chilled “cube cado” is ready to be served. 0 Comments | Posted by admin at 1:31 pm. Leave a comment! 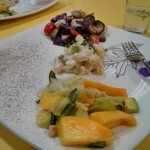 Last week, I was one of the judges for a salad contest held in Manhattan Associates. The participants proved that techies are not only good with computers but also make great chefs. 3 persons emerged winners in the contest that was judged by Arzooman Irani, Executive Chef, Vivanta by Taj, Whitefield, Subramaniam, Senior Director of the company, and yours truly. This salad represents 3 moods – Fresh, Energetic and Playful; which makes a great start for the day. Idea is to offer a choice of mood enhancing breakfast. There are three parts of this salad as detailed below – together they constitute the dish. Cut mango and avocado into small chunks. Mix all ingredients, add salt and sugar to taste. Add vinegar dressing. Cut egg into small pieces. Chop parsley. Mix above ingredients. Add salt and pepper to taste. Serve on a bed of lettuce. Slice and fry egg plant. Cut in half and sauté mushroom. Slice bell pepper and sauté. Cut cherry tomatoes in half. Mix all ingredients with assorted salad leaves, add salt to taste. Add salad seasoning. 0 Comments | Posted by admin at 4:39 am. Leave a comment! A United Nations report talks about the health benefits from eating insects. Insect-eating has been a practice in Africa and Asia for a long time. In Europe, restaurants are beginning to serve them. 0 Comments | Posted by admin at 4:18 am. Leave a comment!